Ballina Stephenites GAA Club is proud to announce the return of its very successful Casino Night. 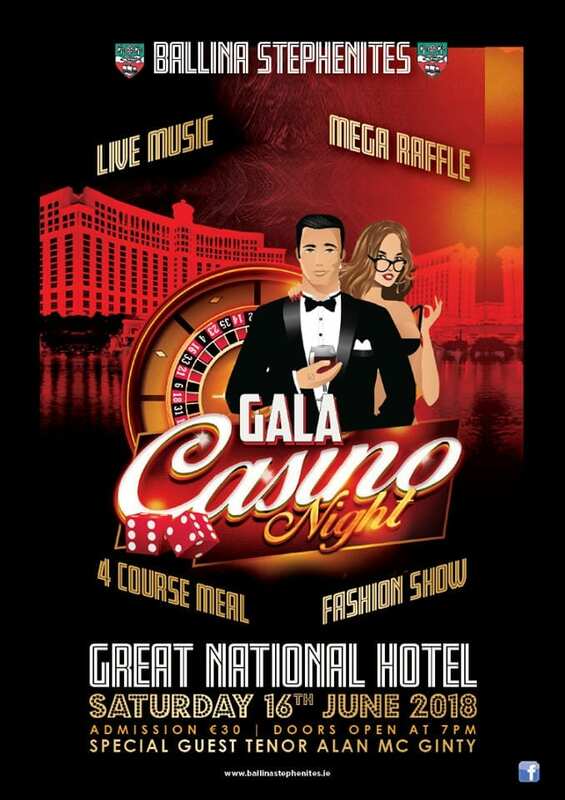 After its inaugural night in 2017 and due to popular demand the Casino Night returns for its second year this June 16th at the Great National Hotel Ballina. So if you are thinking of planning a night out with a difference, a special birthday celebration, a girlie or lads night, a family get together, a work party this is the perfect night; great food, live music, a bumper raffle and plenty of entertainment..Casino style. We have it all organised for you. Tickets can be purchased in Ballina Tourist Office 096 72800, Morans Shoe Shop and Clarkes Convenience Store, and Great National Hotel Ballina. With special Hospitality packages also available from Great National Hotel Ballina 096 23600.